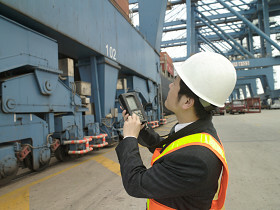 Globalization rapidly transforms the landscape of transportation and logistics industry. It accelerates the demand of complexity in business-related requirements and variety of support services initiated by the customers. In order to intensify competition, transportation and logistics service providers are focusing on shorten process times, optimize capacity utilization and enhance customer expectations with the development of new and innovative time-critical solutions. Track and Trace Solutions help counting and tracking of every RFID tagged transit goods across the entire logistics cycle, customers can instantly retrieve their shipment status via internet at all time. Mobile Proof-of-Delivery Solutions (MPOD) help efficiently disseminate alerts to dispatch crews for the change of route and delivery destination, or even emergency pickup. Productivity can be improved by providing accurate delivery information of shipments and optimized route plans as well as dynamically recording every delivery orders to the system. By leveraging the use of real-time mobility and traceability solutions, it helps companies not only to ensure shipments are delivered on time, but also to speed up the business cycle and increase customer satisfaction for the quality of delivery.